“Make it work.” Project Runway viewers know that host Tim Gunn says that phrase after contestants are presented with a spare tire and burlap and asked to make a runway quality gown. ‘Making it work’ is the phrase that kept coming to mind as I spent the day with Lisa White. Lisa is the director of afterschool programs for Spokane Public Schools (SPS), and she introduced Washington STEM and Spokane STEM Network staff to three of SPS’s summer STEM programs. Lisa knits together levy dollars, private funds, and support from higher education partners. She engages high school, college, and graduate level students alongside professional staff. Her programs serve students of all class backgrounds, students on the autism spectrum, immigrant and refugee students, kids of color, and girls. And, I promise I’ll stop with the Project Runway analogy after this, but she uses all this material to create a beautiful gown lit up with Arduino powered LED’s, shimmering with learning and – wait – does this happen in school??? – fun. Here’s a look at what we saw during our day together. There comes a time in every adult’s life when they find themselves asking a younger person – “so, what do you want to be when you grow up?” The student I asked – a 10 year old girl – turned away from her coding project, looked at me, and said “a theoretical astrophysicist.” I wasn’t sure what answer I was anticipating, but I wasn’t thinking I would have to google the definition of the career after I talked to her. But that’s the sort of environment that the STEM Summer Camp creates. STEM Summer School students explore coding. Hundreds of students, preschool through eighth grade, were enrolled in coding, physics, 3-D Printing, and even crime scene investigation. All were deeply immersed in projects they envisioned and created with the help and support of their high school- and college-aged camp counselors. I saw students soldering wires, analyzing fingerprints, and using sophisticated programs to edit and create music videos. I did let the students making the music video know that video editing would be a great skill if they wanted to pursue a career in nonprofit communications. Not gonna lie, not as enthusiastic a response as I hoped for. 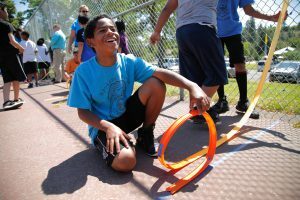 The students in the STEM Summer Camp in Sacajawea are diverse in gender and reflective of the community Spokane Public Schools serves in racial and ethnic breakdowns – so about 85 percent white and 15 percent kids of color. Most families enrolling can afford to pay the $80 a week tuition, although there are scholarships available for those who can’t. And what’s extra great? Lisa can use the STEM materials purchased, and even the summer staff, to help support other programs Spokane Summer Schools engages with. Like…. 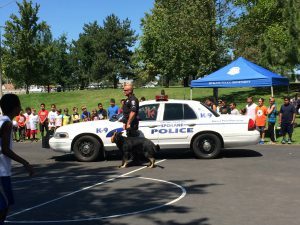 Students line up to greet the police dog. We drove to Liberty Park right next to I-90, the big highway that cuts through Spokane, and the future site of the North/South Freeway. Both act as urban economic dividers, displacing homes and isolating neighborhoods. My immediate impression was that I was witnessing something special during a troubling period of racial and cultural divides – a hundred children, tweens, and teens, mostly African American, laughing, playing basketball, and receiving advice and support from a group of multiracial police officers, African American Church leaders, and community elders. Led by Officer Jennifer Deruwe, these police officers run the Police Activities League – a partnership program with the community to engage students with athletic, academic, and community service programs to secure a positive path forward. A student explores the physics of roller coasters at the Police Activities League. So, what’s the STEM connection, you might ask? Behind the basketball courts, students were just cleaning up after their afternoon STEM activity – engineering structures with Legos. Colorful and creative projects were being broken down as camp counselors talked with students about what they would work on in the coming weeks. The Legos? From the other STEM Summer Camps. The camp counselors? Same deal. Lisa worked with Officer Deruwe to extend the resources she already had (Legos and counselors) to allow other groups of students to engage with and access the summer STEM program. Skylar, one of the teens at the camp, who let us know that STEM activities like this inspired many students to take their STEM interest to the next level, herself included, is competing with her science projects across state lines as part of the Washington MESA program. Skylar also said the mentorship she received from police men and women during her time at Police Activities League inspired her to up her basketball game, to be a better student, and to be a more patient and engaged person. All this and you get to be outside during the summer? Sign me up. After a brief lunch break for my colleagues and a lunch and Pokemon Go break for me (gotta catch ‘em all, what can I say? ), we traveled to the beautiful Gonzaga University campus to meet Dr. James Hunter and hear about the program Gonzaga and Spokane Public Schools operate for 300 SPS students each summer. Graduate students learning to be educators work with English language learners – mostly immigrant and refugee students – on their language skills with a special focus on STEM activities. Walking in the room I realized it was one of those special places where absolutely everyone was learning something – teachers and students alike. And hey, aren’t those the same camp counselors we saw at the other two places? Lisa can really extend a resource. 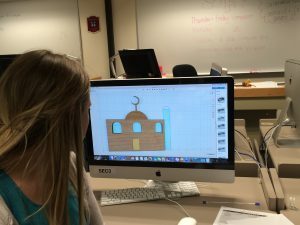 Designing a mosque for the 3-D printer. Students were on break playing red rover outside (don’t get me started on how as the shortest kid in elementary school that game did not work for me) so we got to go in and sneak a peek at their 3-D printing projects. As soon as we walked in, we saw what two students were working on – the mockup for a 3-D mosque. The instructor explained that she had asked students to make something important to them. I looked at other screens and saw 3-D diagrams of crosses, homes, and panda bears (panda bears are important!). It truly touched me to see students able to bring their whole selves to STEM teaching and learning. These young women are designing the safest car in the world. We walked to another building where we saw young elementary school students working together on a design project – building the safest car in the world. The students, who spoke three primary languages between them, laughed and smiled as they drew airbags, breaks, and other more novel and untested safety devices. 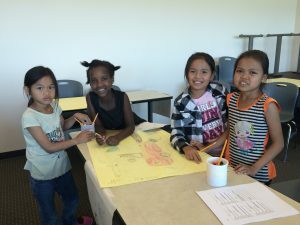 In their own schools, the students might be the only English language learner, but during this summer camp they could interact with each other and, as a result, get engaged in STEM teaching and learning without worrying about how their accent, background, or culture might differentiate them from other students. And so our tour of the Spokane Summer STEM Programs came to an end. 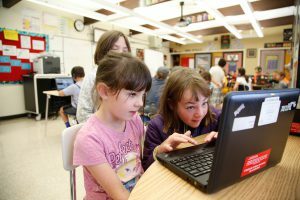 They have set a great example of serving all students by extending resources, engaging students in existing community programs, and using creative ways to “make it work.” Of course, these programs, together with the current resources, aren’t able to serve every student who would benefit from summer STEM activities. We at Washington STEM are committed to continuing to work with the Spokane STEM Network and Spokane Public Schools to bring funding to expand these programs and engage with high-quality STEM teaching and learning and scale this model to other places or regions of our state. Want to know more about the summer STEM programs and how they make it work? Visit http://www.spokaneschools.org/Page/30803.